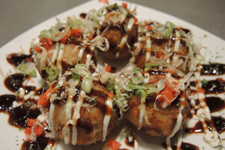 Grilled octo­pus balls with cab­bage. 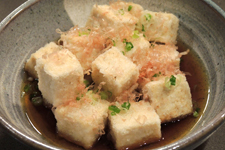 Topped with Japan­ese mayo, pick­led gin­ger, green onions & boni­to. Aloe vera with man­darin oranges, adzu­ki beans & mochi rice cakes. 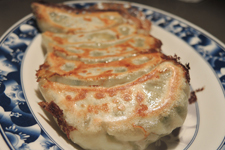 Pan-fried dumplings with pork & chives or cab­bage & car­rots. 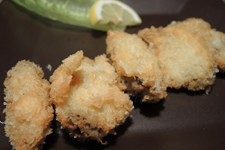 Oys­ters bat­tered in panko and fried. Egg­plant, aspara­gus, green bean, kabocha, pota­to and shiso.